Dr. Meredith Grady and her family. Dr. Meredith’s chiropractic journey truly began when she was 14 years old, as a highly recruited high school athlete in pain. Even taking 16 Advil a day just to step on the volleyball court, she struggled and played through the pain. Her parents learned of the side effects of anti-inflammatory drugs and took her to a chiropractor in order to find a better solution. During her senior year of college at University Oklahoma, Dr. Meredith had to be carried off the court in pain by her father, in a match against Iowa State. Again, she found relief in chiropractic. But it wasn’t until she became a chiropractic student, after graduating from OU, that she realized chiropractic was so much more than pain relief. Dr. Meredith graduated from Parker College of Chiropractic in Dallas, TX in 2002, and was named “Best Intern” out of her graduating class. Shortly afterward, she opened Hands On Health Chiropractic in Grapevine. She is one of the few chiropractors in the area to offer True Spinal Decompression using the DRX 9000C. In 2005, Dr. Meredith and her husband Ryan started 900VB, a nonprofit program which has helped nearly 60 girls to earn collegiate scholarships. Between 2009 and 2011, 900VB boasted a total of four teams qualifying for the Junior Olympics. Dr. Meredith also coaches high school juniors who travel and compete against other nationally ranked teams and clubs, and was IMPACT certified in 1997. She has hosted volleyball camps in Preston, MN and throughout Texas. Most years, you can also find Dr. Meredith teaching the central nervous system portion of high school Anatomy at the local high school. She says “It’s fun to educate kids – they are sponges and just learn so much so quickly!” She loves educating youth in the community and her own patients because she enjoys helping to change impressions about chiropractic. Dr. Meredith enjoys running and cross-fit. But mostly she loves to play and be active with her family. 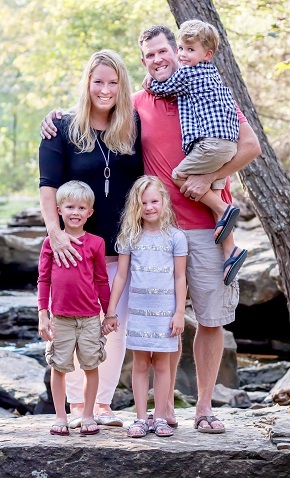 Dr. Meredith and her husband Ryan have 4 kids – Ages 7, 7, 5 and a newborn. Dr. Meredith worked part time while the twins were small, and is excited to be back in the office full time! Hands On Health Chiropractic has a strong practice with tons of families and kids. Roughly 40% of our patients are children – especially high schoolers and young athletes. Many of the local coaches are patients here, and we certainly have a community and family feel about the office. After her undergraduate years at OU, Dr. Meredith moved back to Grapevine and continued to play adult volleyball. She played for the Dallas Cobras (a professional volleyball team) in 1999. In 2002, TAV sponsored her team to Adult Nationals and they finished 2nd in the Women’s A Division. She was named an All-American and also played on a Men’s A team where she was named Tournament MVP (2 awards) and invited to the All-tournament team. At Parker College of Chiropractic, Dr. Meredith was the captain and coach of the volleyball team for all three years she attended. Her team competed in the Chiropractic Olympics each of those three years. Always up for a challenge, Dr. Meredith also played on the 2005 Dallas Diamonds Women’s Pro Football Team as tight end / wide receiver. That year, the team won the Women’s Professional Football Superbowl, and she retired after one glorious season.